How is a filter created for a list? In Advance Concrete, a list can be created using the List Generator application. 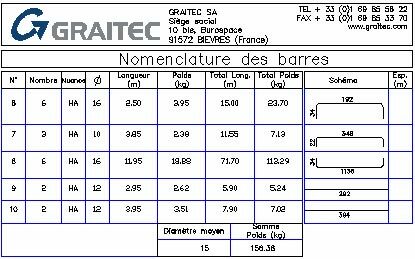 Sometimes we want to create different lists depending on the steel grade type or depending on the bar diameters that are used into a reinforcement drawing. Create a reinforcement drawing for a multi-span beam. Use different diameters (16; 12; 10) and steel grades (FE500 HA and FE235 HX), and then create a list for it. For this example we will use the "Nomenclature des barres classique" list, from the France folder. The list contains all the bars that are in the reinforcement drawing. To display in the list only the FE500 HA or FE235 HX steel grades we have to add a new attribute and then the list must be redefined using List Generator application. Launch the List Generator application and open the drawing that contains the list. The list is found in Advance Concrete's library, which is stored on the computer's hard disk drive. An adjacent attribute will be copied next to the list's body. The new attribute will be edited and renamed to < SteelGradeName=='FE500 HA' >. This way the list will contain only the bars that have the desired steel grade, in this case FE500 HA. Define the list body using the "Define list body" option. Select the body's line without the new attribute added, and then press Enter. The new dwg file is saved in the same location where the initial drawing was opened but with another name in order to also be used in the initial drawing. 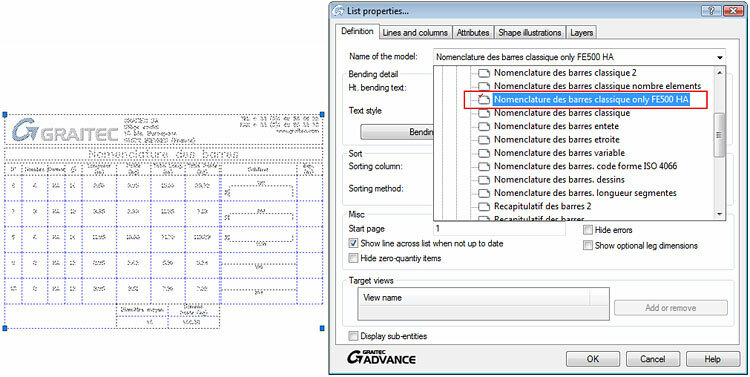 To use the newly created list, open the reinforcement drawing in Advance Concrete, select the list, open its properties page and select the new list. Next to the list there is an attribute that has a value of "1". If you do not want to see this value, edit its attribute and choose a very small text height. 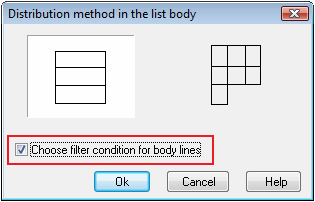 Using the same steps (described above) define the list body using the "Choose filter condition for body lines" option. If you want a new list which will display only two steel grades, for example FE500 HA and FE235 HX, the attribute is renamed to < SteelGradeName==' FE500 HA' | SteelGradeName==' FE235 HX' >. This method can be used to create a filter for the bar diameter. For example, if you want to display only the 16, 18, 20 diameters add the < (NominalDiameter==16) | (NominalDiameter==18) | (NominalDiameter==20) > attribute. Next, follow the steps described above.